WE LOVE DEER AND THIS LITTLE FAWN IS SO SWEET. ORIGINALLY WAS GOING TO PUT IT IN OUR GARDEN BUT WE DECIDED TO KEEP IT IN OUR FAMILY ROOM SO WE CAN SEE IT ALL THE TIME. IT'S BEAUTIFULLY PAINTED AND JUST LOVE THE POSE. 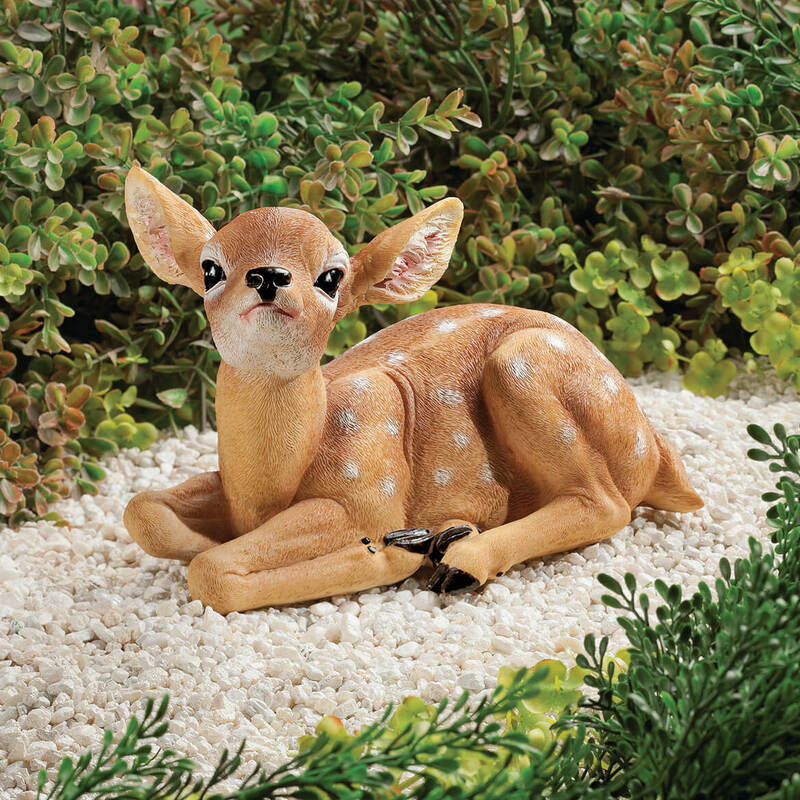 I AM STARTING A COLLECTION OF DEER , THIS BABY FAWN LOOKS SO REAL , MAKES ME SMILE EVERY TIME I LOOK AT IT. I really enjoy having this little fawn figurine . I have it in my home right by the tv until spring comes so I can fix up the porch to place the fawn and goose figures next to some flowered plants. the artistic colors makes the fawn almost realistic looking. Who knows I may just keep the fawn inside away from outside elements. Debated about ordering this product because I thought I might be disappointed. When it arrived, I was so glad I chose it because it is so authentic looking. I will probably order this item for others in the future. Cute sitting on my coffee table while waiting for Spring to go in the garden. 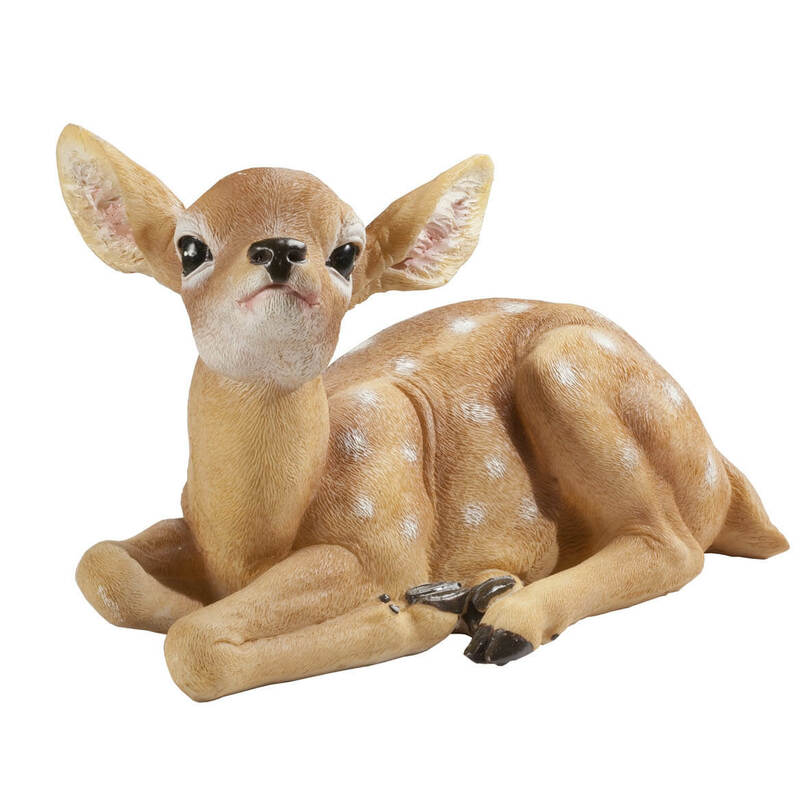 Would also look cute on a lower shelf of a cabinet or bookshelf as the fawn is looking up with winsome eyes. Hoping that that the colors don't fade outside or maybe I'll just keep it on the shelf indoors! Beautiful ! This is for my Dad's grave this Christmas !! He loved deer !! I have two cement statues of deer a buck and a doe, so I thought this fawn would work great as an addition. This product is the exact scale to fit into my rock garden in the front of my apartment. It was just what I was looking for. Perfect addition to our yard. Very cute, and just the right size! I used this in a memorial for our daughter along with a lambs as a tribute to her.. Our girl Stella was very beautiful and died at age 16 .. she always loved animals .. such as the deer and was very loving as a lamb. We have our memorial in a very special place which was her favorite spot. I added some marble chips and solar lights for night time lighting. Plus an angel over looking both the lamb and also the fawn. The figurine is very beautiful and heart warming. Many thanks for having this in your product line. This product is absolutely beautiful. This fawn is so beautiful; the eyes and face are outstanding. The fawn is so lifelike. The item will fit in perfectly in the garden under a palm tree with a doe and buck. They have been waiting for their offspring to arrive. He is here and everyone who walks by will enjoy the details of this fawn. What a face! The price is so reasonable. Everyone should buy one even if they do not have a doe and buck. added this to my nativity set. A forest animal for your garden decorative needs. I love Animals, and have several, always looking for more. The Design is just so real, and hope they will have more and a little bigger. This is the cutest little deer with such a sweet face. It makes you smile!! Your products are good, we've ordered before and will order again. Thank You ! It would look cute in the garden. Thought it would be cute in garden. I LOVE DEER. THIS FAWN TOOK MY HEART. I ORDERED TWO FOR INDOOR DECOR. It is a beautiful piece with good detail. I own one and wanted another for a different area. I have been looking for deer for my garden and they were so expensive everywhere else. So thats why I got 2 of these. will be using as a decoration for a woodland themed baby shower. Needed it to put under leafy tree to authenticate "Bambi's thicket"
Have one at the cemetery and wanted another one. This fawn has beautiful detail, especially, the eyes. This complements the buck and doe. I ordered one for me and one for a friend. This is a good buy! Just wanted something for outside. It looks pretty and the reviews are very positive as well. Perfect figurine for my grandchildren's play area. Very cute and they love it. Needed something for my front yard garden. The reviews were good and he's seems to be a good size and cute. I just love animals, esp. deer. Goes with my doe and fawn. to display in my garden also like is lightweight can`t wait to get it. BEST ANSWER: Thank you for your question. The dimensions are 7 3/4" L x 3 3/4" W x 4 3/4" H. We hope this information will be of help to you. What are the dimensions? The description says 3/4" L x 3 3/4" W x 4 3/4" H--that is tiny and can't be right! BEST ANSWER: Thank you for your question. The full dimensions are 73/4" L x 33/4" W x 43/4" H. We hope this information will be of help to you.